The incredible comeback continues. Roger Federer won a record-tying fifth BNP Paribas Open crown on Sunday as he defeated Stan Wawrinka 6-4, 7-5 in an all-Swiss final at the Indian Wells Tennis Garden. 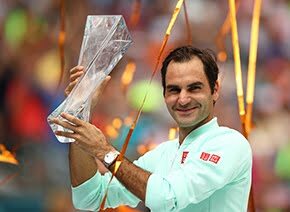 The Swiss endured a six-month injury layoff at the end of 2016, but returned to tour-level action at the start of the season in spectacular fashion, capturing his 18th Grand Slam championship at the Australian Open with a five-set victory over Rafael Nadal. He has established himself as the early leader in the ATP Race To London, which determines the eight players to qualify for the ATP Finals in London in November. He is now set to rise back to No. 6 in the ATP Rankings, having started his comeback this year at No. 17. 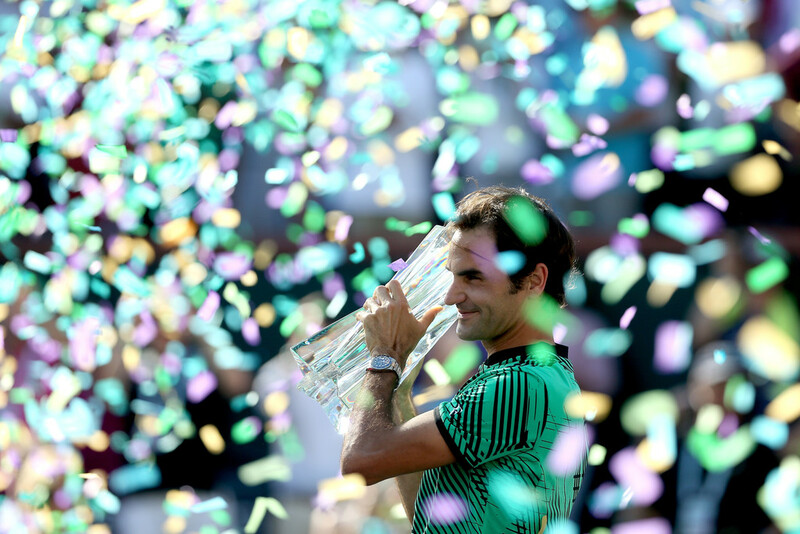 Victory in Indian Wells marks Federer’s 90th tour-level crown and his 25th ATP World Tour Masters 1000 title. At 35 years old, he is the oldest Masters 1000 champion since a 34-year-old Andre Agassi won the 2004 Cincinnati title. Federer has played seven finals in the desert, previously lifting the trophy in 2004-‘06 and 2012, while also finishing runner-up in 2014-15. Federer’s backhand has been the talking point of the 2017 BNP Paribas Open, and he set the tone in the final with a rifled winner off that wing in the first game, one of 10 winners he would hit in the opening set. The right-hander has also dominated on serve, coming into the final having faced only one break point throughout the tournament, and he allowed Wawrinka just four points in the first set. Federer made his move on Wawrinka’s serve in the 10th game of the opener, drawing a forehand error from his countryman at 30/30 to earn a set point, which he converted as Wawrinka overhit another forehand. History was stacked in Federer’s favour against Wawrinka, with the Basel native coming into the final leading his countryman 19-3 in their ATP Head to Head series and a notable 14-0 mark on hard courts. But Wawrinka put that firmly out of his mind as he came out firing at the start of the second set, breaking Federer for the first time in the tournament before surviving a nervy service game - saving two break points - to engineer a 2-0 lead. It was the first time Federer had been broken in 42 service games. Wawrinka’s lead was short lived though. Federer struck back to claim the next three games and broke Wawrinka in the 12th game to claim victory, sealing it in 80 minutes as he punched away a forehand volley winner. As Federer waved up to his wife, Mirka, and family, Wawrinka was left to ponder his third defeat in four Masters 1000 finals. 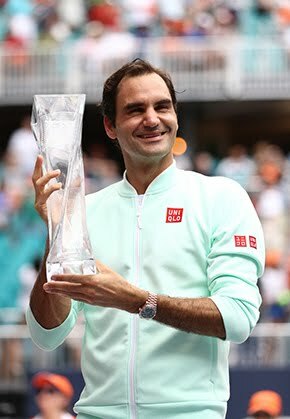 The 31-year-old Swiss won his lone Masters 1000 crown three years ago in Monte Carlo and recorded runner-up finishes in 2008 Rome (l. to Djokovic) and 2013 Madrid (l. to Nadal). It is the second time this year Wawrinka has fallen to Federer, having suffered a heartbreaking five-set loss in the Australian Open semi-finals in January. Wawrinka had battled through to his 26th tour-level final with back-to-back third-set tie-break wins over Yoshihito Nishioka, who served for the match twice, and Dominic Thiem, before dominating Pablo Carreno Busta in the semi-finals. But the final loss still marks a great accomplishment for Wawrinka. Years ago, you would have been hard-pressed to find someone who would have thought the 6-foot right-hander would meet Federer in a Masters 1000 final. As recently as 2012, Wawrinka's ATP Ranking still sat outside the Top 20. That same year, Federer hauled home three Masters 1000 titles. “I think to play a final against him in a Masters 1000 is something amazing for me. 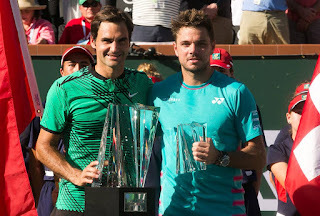 I wouldn't have dreamed that a few years ago and now it's the second we have played,” said Wawrinka, referring to their 2014 Monte Carlo Rolex Masters final. “I won the first one. I lost today. For sure I'm disappointed, but it's still a great week for me. “He's still a tough player to play for me, for my game, because he's playing quick. He makes you feel uncomfortable and he mixes it up a lot. It's always challenging. “He's just amazing. The way he's playing is just so beautiful, it's just so nice. Everything looks perfect. He's moving amazingly well. He has amazing touch. He's doing everything you can do on the tennis court,” Wawrinka said.